WHAT IS CHIN WHISKERS METAL SCHOOL? WE ARE JUST THAT, A METAL SCHOOL. BUT NOT THE TYPICAL BORING. DO NOT TOUCH ANYTHING, STOP PLAYING AROUND TYPE OF SCHOOL. WE ARE LET'S HAVE FUN, LET'S TRY SOMETHING NEW, LET'S ROCK AND ROLL TYPE OF LEARNING FACILITY!!! CHIN WHISKERS METAL SCHOOL TAKES PLACE IN A FULL SERVICE WORKING METAL FABRICATION FACILITY LOCATED IN CLEARWATER FL. 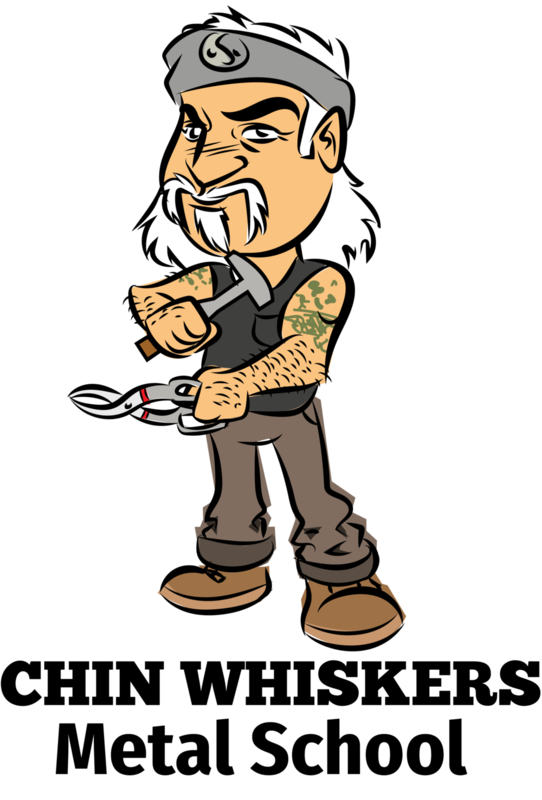 CHIN WHISKERS METAL SCHOOL WAS CREATED TO PROVIDE AN OUTLET FOR PEOPLE INTERESTED IN THE ART OF METAL FABRICATION. FROM "I'VE NEVER USED A TOOL BEFORE" TO SKILLED PROFESSIONALS, WE CATER TO ALL. wE PROVIDE EASY TO UNDERSTAND DIRECTIONS AND GREAT STEP BY STEP GUIDANCE. THIS MAKES YOU ABLE TO BUILD YOUR VERY OWN METAL CREATION IN ONE CLASS VISIT. THE CLASSES ARE OFFERED THROUGH OUT THE MONTH. YOU CAN SEE WHAT IS BEING MADE AT THE CLASS YOU'RE INTERESTED IN. THERE ARE BASIC CRAFT CLASSES AND BEGINNING WELDING/ FABRICATION CLASSES. WE EVEN OFFER ONE ON ONE CLASSES FOR A SPECIAL PROJECT THAT YOU'VE HAD IN YOUR MIND FOR YEARS. THIS IS JUST A FEW OF THE CLASSES WE OFFER AT CHIN WHISKERS METAL SCHOOL. PLEASE LOOK AT THE CALENDER TO SEE A MORE COMPLETE LISTING. THE CLASSES CHANGE ON A REGULAR BASIS, SO CONTINUE TO CHECK IN. HERE WE ARE MAKING AN ALUMINUM BOX. IT CAN BE USED FOR TOOLS, FISHING GEAR OR TO STORE YOUR SECRETS.. THIS IS A BASIC CLASS THAT WILL INTRODUCE YOU IN TO METAL FAB. YOU WILL BE USING SNIPS, A DRILL, AND A RIVET GUN. IT'S THAT TIME OF YEAR...TIME TO TEND THE GARDEN. WITH THIS AWESOME TOOL TRAY YOU WILL BE ABLE TO KEEP YOU CLIPPERS AND SHOVELS IN ARMS LENGTH. AGAIN THIS IS A PROJECT TO INTRODUCE YOU TO BASIC METAL FAB. YOU WILL BE GUIDED THROUGH OUT THE WHOLE CLASS SO YOU WILL BE PROUD OF WHAT YOU BRING HOME. THIS IS A SAMPLE OF THE "MUSIC AND METAL" CLASSES THAT ARE OFFERED EACH MONTH. EACH CLASS HAS A THEME MUSIC THAT LENDS ITSELF TO THE TYPE OF PROJECT THAT IS OFFERED. WE TAKE YOU A STEP FARTHER IN THE METAL FAB LIFE. WE TEACH YOU BASIC WELDING SKILLS AND PUT THEM TO USE MAKING AN ART PIECE FROM RECYCLED METAL......PARTY ON!!!! We are super excited to hear from you. please fill out the form below and we will get right back to you. if you need to get ahold of us immediately please contact us at the phone number listed. Thanks again!